Volunteer in the Fish Kitchen! It’s officially our busy season and we have an urgent need for volunteers. Learn more about the shifts available and sign up today to make a difference for our pups! 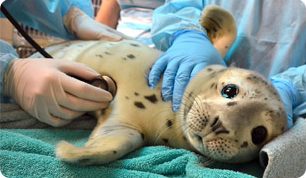 It's the time of year when elephant seal pups, harbor seal pups and California sea lion pups like Popsicle arrive at The Marine Mammal Center in large numbers. You can help feed these pups with your donation today. This summer, get ready for a week of fun in the sun as you and your friends explore all things ocean at Camp Sea Quest! Rising 5th-8th graders can register today! Dr. Shawn Johnson talks to the Washington Post about how our work with marine mammals helps us better understand the impacts of climate change on our ocean. See our busy season in action!